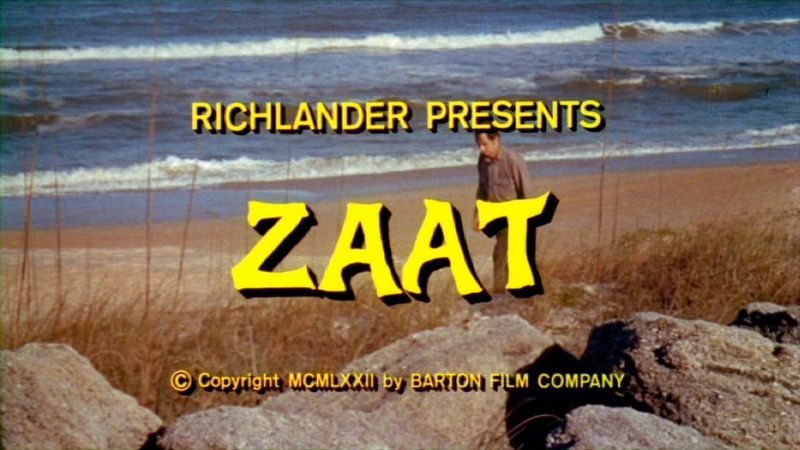 When I sat down to watch Zaat , I wondered why I’d done this to myself. Entering October I’d only written a dozen of the reviews I’d need for Hubrisween, and even though these are generally shorter than my normal reviews that left 14 to write in under a month. Then, to top it off I’d be ending with a movie that had been painful even with the wise cracks from MST3K over the top of it! Maybe it’s the fatigue talking, or perhaps a side-effect of having watched Up From the Depths the day before, but I didn’t find the experience unbearable. I’m not saying it’s a good movie, but it has enough genuine effort and quirky charm in it to be a nearly pleasant distraction. The restoration for the new bluray release makes the colors vivid, which greatly improves the experience of watching it. With the dingy veneer removed, it’s somewhat less cheap and depressing. The footage of Leopold swigging Bromo is much less dingy. The faults are glaring in this one. For starters, the movie begins with a bizarrely pompous speech on the virtues of quite a lot of fish. But the narration doesn’t stop with the fish footage. As we follow the ichthyophilic Dr. Leopold into his shabby beachfront lab, he continues to narrate his thoughts — most of which center on standard mad science rhetoric about showing them all. I may have blinked and missed it, but I don’t think that he ever speaks aloud. Maybe in a flashback to his eviction from mainstream science. The acting is largely passible to competent, especially among the characters who we see the most of. There are a few truly awful actors, but fortunately they only have a line or two. 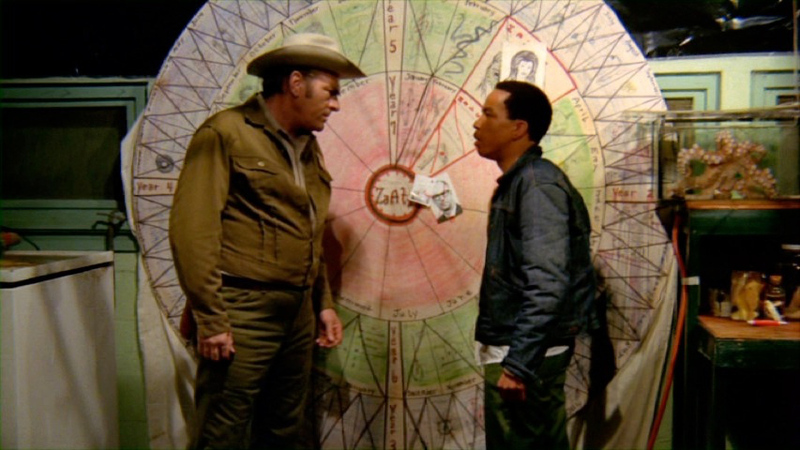 What’s truly bizarre is that two of the main characters are members of the Inter-Nations Phenomena Investigation Team, or INPIT, an organization that apparently sends romantically involved pairs to do basic police work when bumpkin sheriffs are failing to match wits with mad scientists bent on human annihilation. They have action suits. 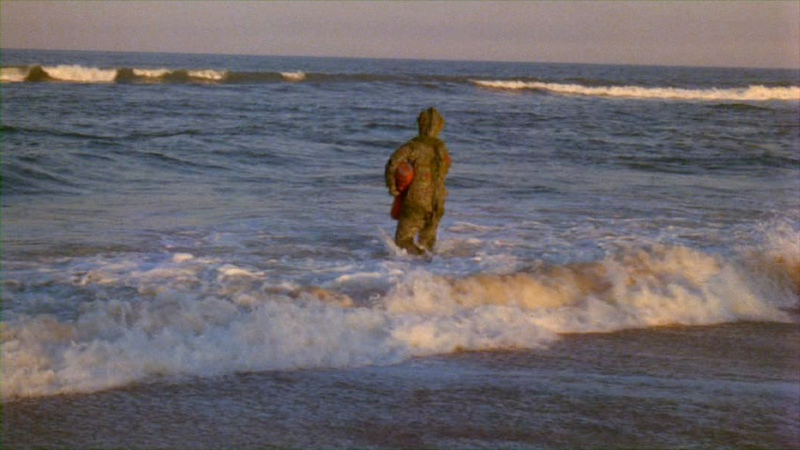 Much of Zaat is concerned with the sheriff, the INPIT agents, and a marine biologist running around trying to figure out why walking catfish are attacking people. We never see evidence of these attacks, but there is a shot of catfish crowding up next to a road. For all we know, they spend the rest of the movie waiting for traffic to let up so they can cross. It’s a little strange then that it takes our heroes over half the movie to notice the tall, bipedal fish that’s killing people. When they finally check out Leopold’s lab and see the murders laid out as part of his Spinning Wheel of Revenge plan they’ve gotta feel pretty dumb. Rex and Sheriff Lou marvel at the Wheel O’ Revenge. As stupid and often dull as this movie is, I kind of love it for its commitment to mad science. Years previously, Dr. Leopold saw the potential of mixing the compounds Za and At to cause radical mutation, but the people in charge of the government research station wouldn’t allow him to pursue his dream of turning people into fish. So he quits and waits for his chance, buying the facility when the government finally abandons it, and continuing his work with stolen tanks of leftover ZaAt. He works revenge into his scheme to raise an army of fish, writes it all down on a giant circle, and keeps his time-table down to the month! This, despite mechanical failure botching his initial attempt to create a mate and receiving injuries once INPIT figures out what he’s up to. Leopold’s the very model of a successful mad scientist! I think there are two major things working in his favor. The first is that he turns himself into an unstoppable monster before making his presence known. Heck, the sheriff knew about Leopold’s purchase of the research facility but never mentioned it because he hadn’t seen the doctor in years. The other factor in his success, I believe, is that he works alone, with no assistant to rebel or accidentally break things. So whatever else, the film shows how a classic scientific villain can achieve lofty, world-destroying goals. 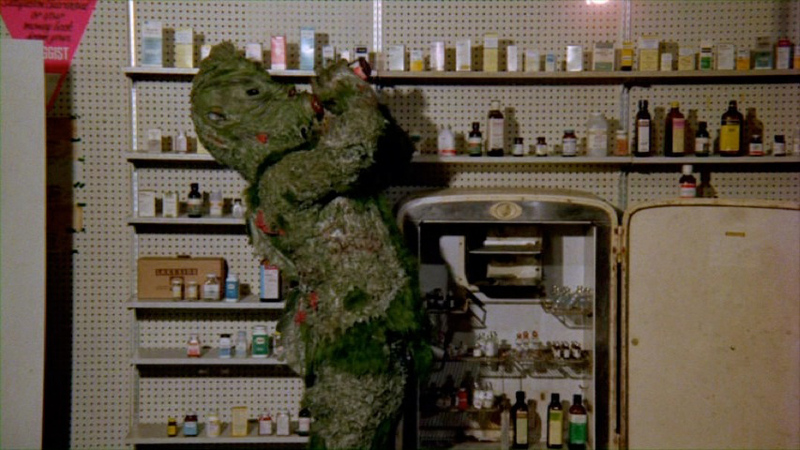 That’s all I have to say about Zaat . This concludes the 2015 Hubrisween event. I hope you’ve enjoyed the month-long look at non-spider scares. The Web of the Big Damn Spider will be returning to arachnid-themed entertainment and memorabilia next week. Hubrisween departs, like the majestic man-fish returning to the sea from which it wasn’t born.